Now Offering: Photogenic Back Covers, Comp Cards and Banner PostingStarshine's All American Girl National! Subject: Tired of paying big bucks for a big crown?? Subject: SPECIAL PACKAGE DEALS & GUESTBOOK DRAWINGS GOING ON FOR FEES OFF! 27-29 Dream Dolls State-Myrtle Beach, S.C.
10-12 Worlds Most Beautiful Nat.-Orlando,Fl. 16-19 Cover Miss Nat.- Fl. 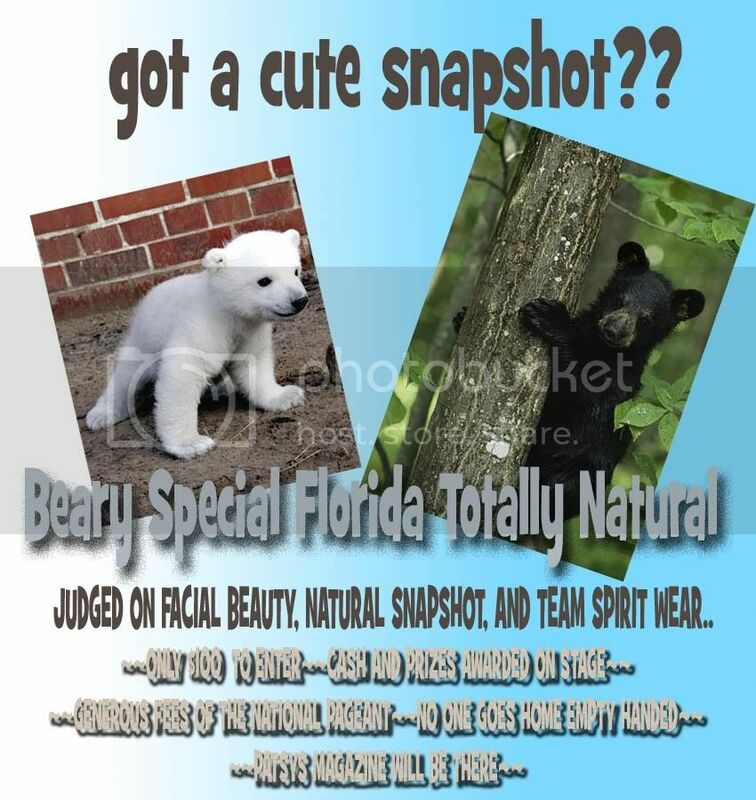 CLICK ON BANNER ~or~ visit our website at http://flbearyspecial.googlepages.com for more info. Join us for the fun..Patsys will be there!! Sign our guestbook and win fees off your national package!!! Resort vacation for a family of 4 plus theme park tickets for all 4 days! night! Reserve your room today! Subject: WE ARE NEW, FUN, FAIR & FABULOUS!! Subject: JOIN US FOR A FUNFILLED WEEKEND! WHO WANTS TO GO TO DISNEY??? WALT DISNEY WORLD VACATION PACKAGES!!! Be Creative and compete in Disney Wear! Ice Cream Party Saturday night. we're having a surprise guest! Subject: DEADLINE IS THIS FRIDAY!! WITH THIS SIMPLY GORGEOUS CROWN! BACK TO THE BASICS OF PAGEANTRY. NO HAIRPIECES, FLIPPERS, OR BIG PAGEANT HAIR ALLOWED! JUDGED ON 50% FACIAL BEAUTY, 25% PERSONALITY AND 25% OVERALL APPEARANCE. AND SOFT, BEAUTIFUL AND ELEGANT FOR THE 10- UP. Over 65 cash titles, Over $60,000 in bonds! Subject: Open to all areas!! Subject: DEADLINE IS FEB. 27TH!! THIS COULD BE YOUR CHILD'S FUTURE! Join us for our 9th Annual Mini National!! Only $195 Supreme Package Price!! Join us in Bristol, VA! 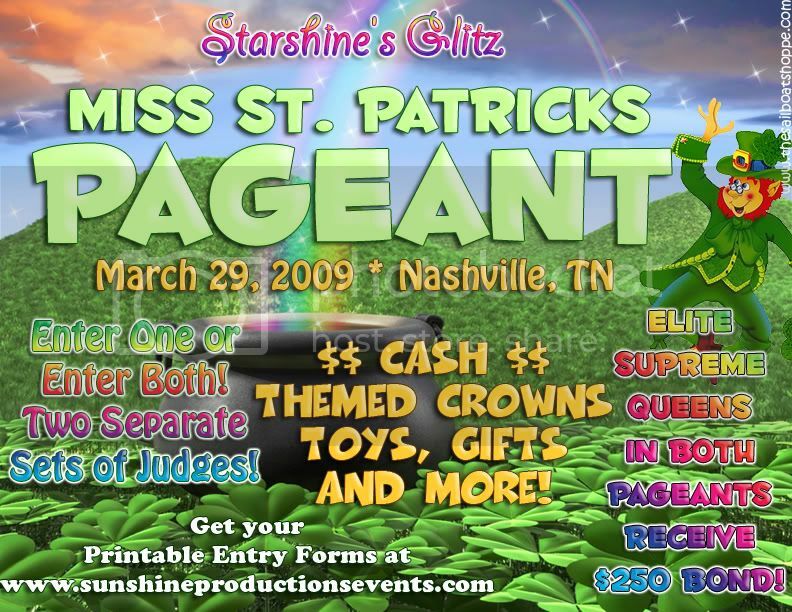 Gorgeous Custom Crowns, Monogrammed Sashes, Awesome Awards and win your Supreme Package paid to our 2009 Christmas National to be held November 20th - 22nd in Pigeon Forge, Tennessee! Bonds and Titles to be Awarded! Click on the banner for your entry form! Deadline to enter is February 3rd!!!! Accepting Glitz and Natural Photos!! Deadline to enter is February 3rd!!! All info. is printable from our website! Don't miss the February 3rd Deadline to enter!!! Soooo many reasons to attend Porcelain Dolls! 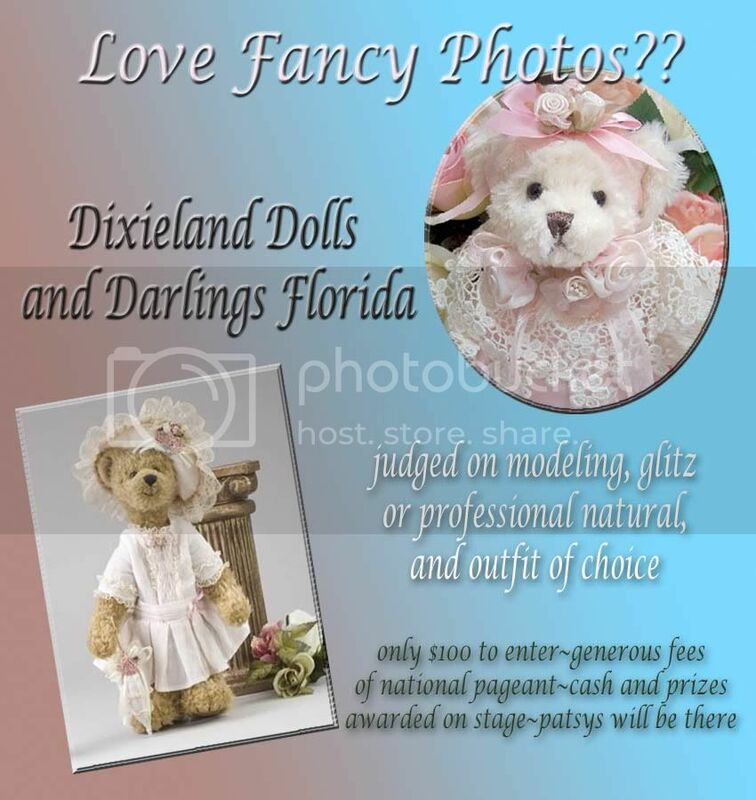 Have you sent in your Porcelain Doll entry yet? Hotel is already warning - it WILL SELL OUT!!! The Porcelain Dolls Host Hotel is Already Warning Us They WILL SELL OUT our weekend! Not only is it Memorial Day Weekend - but there are also several conventions! Please Reserve Your Hotel Today! Subject: Email for great deals going on now!!!! WIN YOUR SUPREME PACKAGE TO NATIONALS. TO BE HELD APRIL 24-26. Subject: Chelsea is a DBH darling! Chelsea is a DESIGNS BY HOLLY Darling, are you? CHELSEA is a DESIGNS BY HOLLY darling! Are you? Congratulations to Miss Chelsea Holden! CHELSEA has her winning DESIGNS BY HOLLY, do you? Dressing local, state & national winners nationwide! 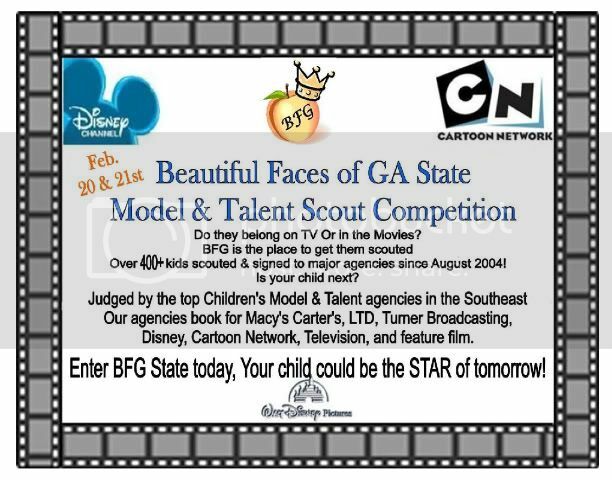 Subject: DO YOU HAVE A BEAUTIFUL & TALENTED CHILD! NO PRO-RATING! NO COMBINING AND NO WAITING!! All you need for supreme is your beauty score and one optional! 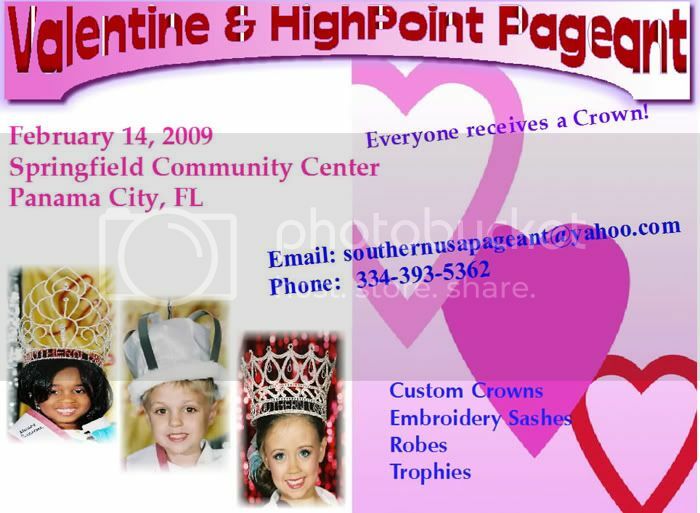 Awesome 12 inch custom bucket crowns, toys, gifts, movie night party and our magical cupcake & floral stage! Loads of supreme titles! 0-3, 4-8, 9 & Up! Age as of September 1st 2008. AGM is a facial beauty pageant! Sorry, no door entries. Paypal, credit/debit cards by phone and online entry forms accepted. This is THE year to enter America�s Grand Miss! Numbers are LOW and we never pro-rate or combine! AGM is brought to you by the same producers of TDS for 14 years! Dependable and with a proven track record for awesome national productions. SO MANY CHANCES TO WIN AT AGM! WE ARE A FACIAL BEAUTY PAGEANT! NO PRO-AM, NO GLITZ DRESSES, WE JUST NEED YOUR BEAUTIFUL FACE. BEAUTY AND 1 OPTIONAL = SUPREME! NEW THIS YEAR! ELEVEN Novice Beauty. COME WIN OUR ONE OF A KIND CUSTOM AGM CROWN! VISIT OUR SITE FOR DISCOUNTS STILL AVAILABLE! Be at AGM and be seen by modeling and casting agents! These agents will be signing models and scouting for new talent. AGM has an entire separate panel of qualified pageant judges also. It�s not too late to join us!! Watch for more exciting news coming soon! 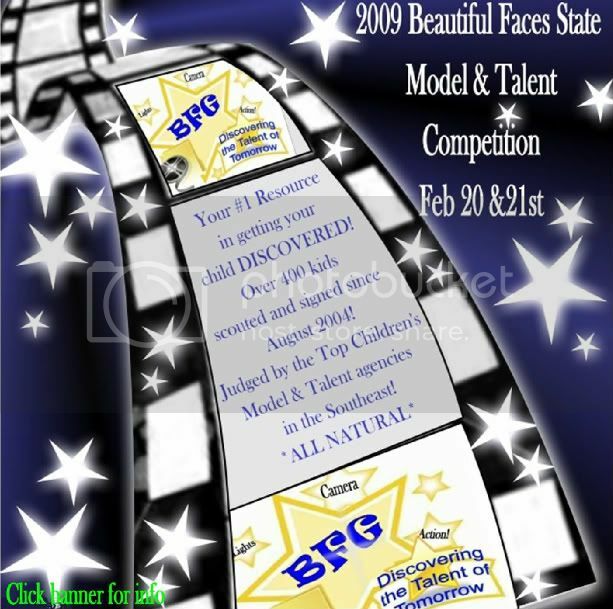 BE THE AMERICA�S GRAND MISS FACE OF 2009! Still time to enter America�s Grand Miss National! 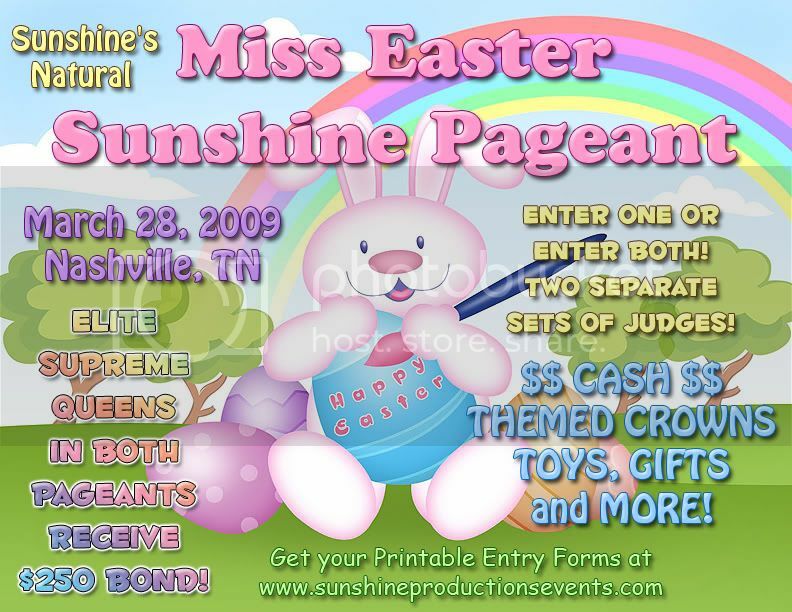 This is the perfect pageant for girls of all levels of experience! Supreme is beauty and one optional event! Visit our web site for details on how YOU can win fees off! Numbers are still low and we never pro-rate! (843) 681-4812. !! AMERICAS GRAND MISS !! 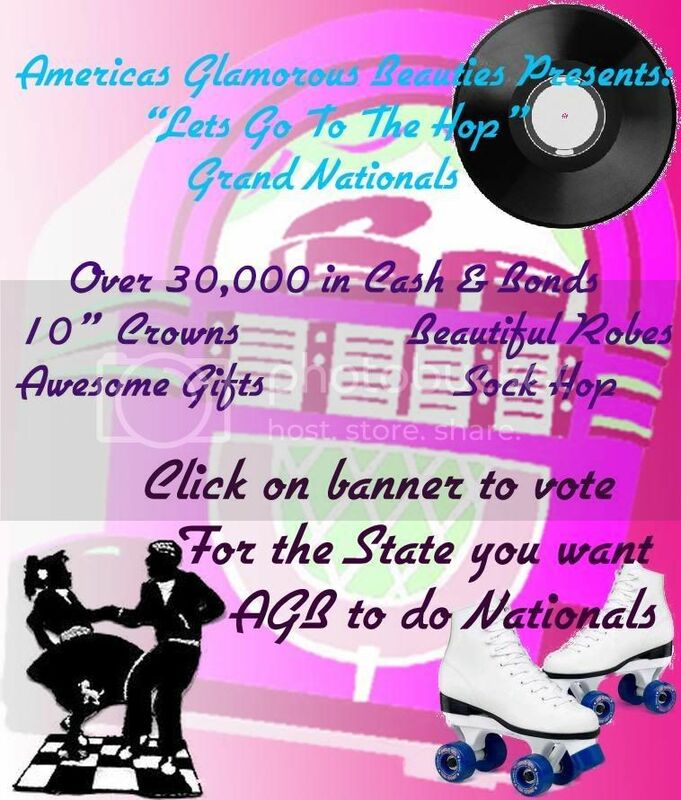 6-8 Americas Grand Miss Nat.-Atlanta,Ga. 21-22 Beary Special Nat.-Nashville, Tn. 6-8 Majestic Faces Nat.-Clarksville, In. 27-29 Rising Stars Grand Novice-Louis, Ky.
22-24 Porcelain Dolls Nat.-Louis, Ky.
Subject: DBH - STUNNING DESIGNS! ORDER YOURS TODAY! NOW OPEN TO ALL AGES! will each take home a gorgeous custom Porcelain Dolls crown, monogrammed banner, National gift package PLUS a whopping $5,000.00 bond!!! DO YOU HAVE YOUR WINNING IMAGE? This is the only photo contest we will be having, so don't miss it! Winners will receive the BEAUTY FEE AND 1 OPTIONAL paid. Winners will receive $95 BEAUTY FEE. Winners will receive $75 off the BEAUTY FEE. Winners will receive $50 off the BEAUTY FEE. 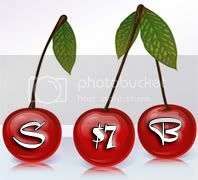 CLICK BANNER FOR MORE INFO!!! Banner And Posting By: Home Of The $3 Banners! Saturday Night Disney Theme Party!!! Disney Trivia Contest Now Going On! 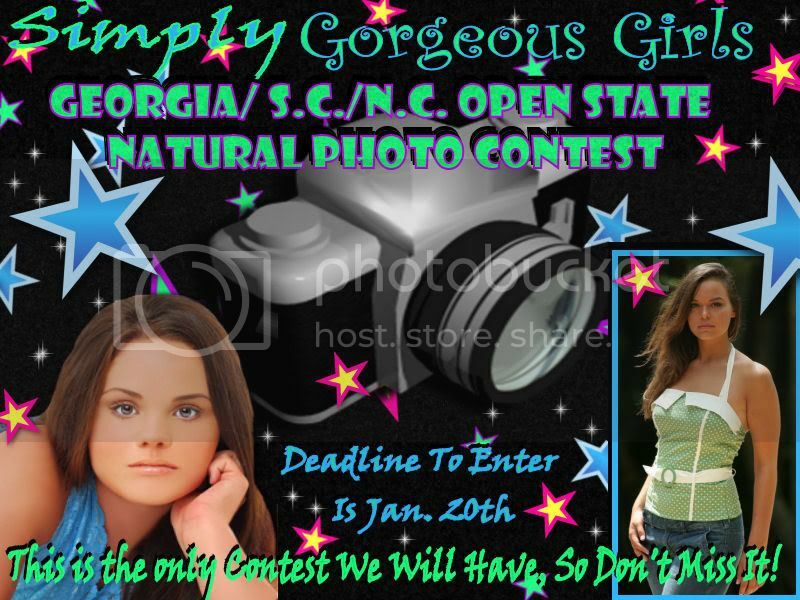 * * Siimply Gorgeous Girls* *NC/SC GA Photo ContestThis is the only photo contest we will be having, so don't miss it! 6 SupremesWinners will receive $95 BEAUTY FEE.6 Gorgeous Girl Face Supremes (facial beauty only)Winners will receive $75 off the BEAUTY FEE.6 Mini SupremesWinners will receive $50 off the BEAUTY FEE. We Are Awarding Twins Again This Month! Judged on facial beauty only! YOU Could Be On Our Next Banner!! Chance to win a FREE complete package paid to nationals! Contest Ends January 6th * No Extending! Click banner and email to schedule your shoot! Subject: Let's Have Some Fun! THERE'S NO NEED TO GO CRAZY!!! HAS PLENTY OF TITLES TO BE AWARDED!!! 39 TITLES TO BE WON!!! 3 Cinderella Supremes and MANY, MANY more!!! DISNEY TRIVIA CONTEST COMING SOON! You can win fees off to Nationals!!! National paperwork is now ready!!! stabilizer plus we miter the shoulder for better fit! No extra charge for crown at shoulder or 2 lines of writing! VALENTINE SASH SALE!!! ORDER YOUR VALENTINE SASHES FOR ONLY 10.00!!!!! ONE WEEK ONLY.. SALE STARTS JAN. 3RD AND RUNS THRU JAN. 10TH. Sashes that winners love to win!National quality sashes.. prelim prices!! Send your $150 Deposit to enter!!! Or Email ajpageantprod@aol.com for paperwork! that's why we make sure that your banners get the exposure you need. Posting to all the major voy boards from coast to coast. This includes all Bravo boards and hundreds of boards across the country. 1. Fast Dependable Service When You Need It! 3. You Get The Most For Your Money! A detailed letter with all prices and information can be obtained by emailing: LU-LU2@COX.NET. Don't skip breakfast. You will lose weight more quickly if you have a bite to eat in the morning. Drink hot water with lemon Eat hot meals rather than cold. Your metabolism speeds up very slightly when you eat and again if the food is hot. Do at least thirty minutes of cardiovascular exercise, five days a week. This will condition you to burn fat more efficiently. Don't deprive your body of carbohydrates, no matter what they say.